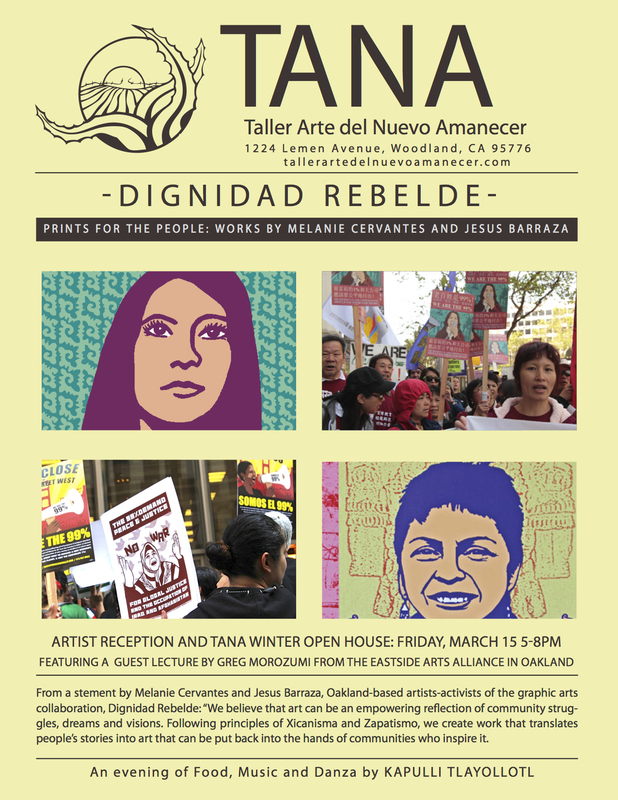 We invite you to our 2013 TANA Winter Open House & Dignidad Rebelde Exhibition Opening Reception. March 15th from 5-8pm, we will be hosting our Winter Open House to welcome the community youth and families who have participated in the Winter community screenprinting workshop from January-March. The Winter Open House will coincide with the opening reception for TANA’s latest exhibition titled Dignidad Rebelde: Prints for the People, which features the artwork of Melanie Cervantes and Jesus Barraza. Dignidad Rebelde is an Oakland-based artist/ activist/ graphic arts collaboration that has been prominent in many nationwide and international civil rights struggles centered on community self-determination for historically marginalized and at-risk communities. Please join TANA on March 15th for an evening featuring artwork from the TANA Winter Workshop and Dignidad Rebelde: Prints for the People, along with a guest lecture by Greg Morozumi of the Eastside Arts Alliance and Danza by KAPULLI TLAYOLLOTL. TANA is a community art center located in Woodland and managed by the Chicana/o Studies Department at UC Davis. This is a free event, for more information and please feel free to email: tana@ucdavis.edu or call (530) 402-1065. Please feel free to forward this information to interested youth and community members.